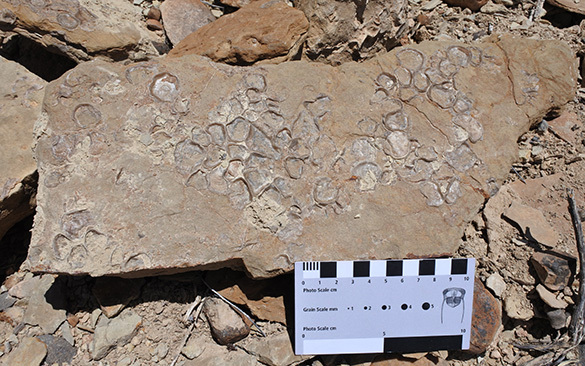 Santa Clara, Utah — Team Jurassic worked almost entirely on the oyster ball project today in the Gunlock region. 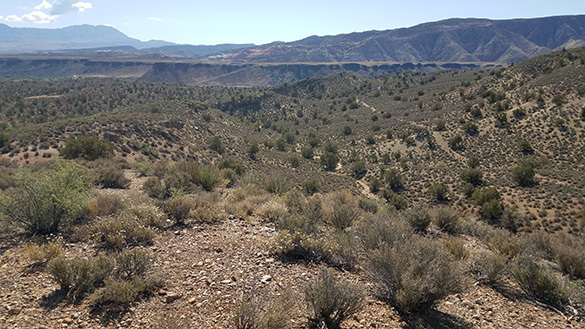 First the students measured the three primary dimensions of several dozen oyster balls (ostreoliths) at the C/W-157 locality (the left side of this valley), and then we followed that road across the slopes to our “Double Layer” (DL) locality in the middle distance. Nick took this image looking southeast. Ethan (on the left) and Galen are measuring oyster balls in the upper of two layers at the (not surprisingly named) Double Layer locality. 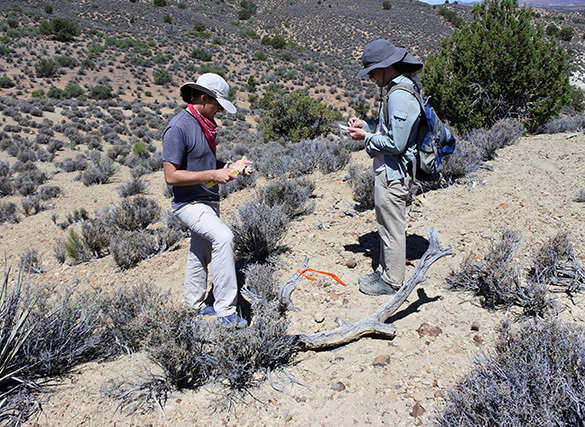 We use orange surveyor’s tape to mark our sections and items of interest before collecting data. The large oyster balls in the lower layer sometimes had to be dug out of the ground. Here are some of the giant oyster balls. 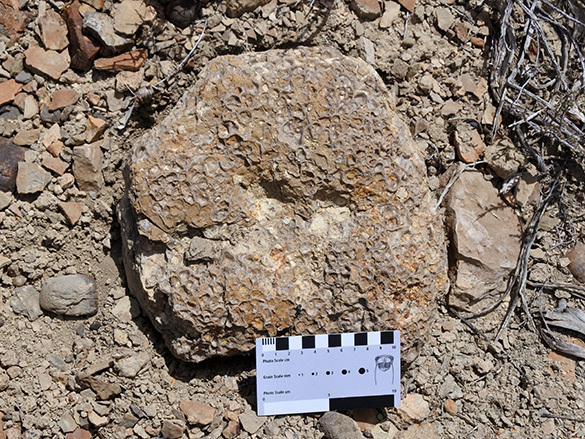 They are flattened, but still have oysters on the undersides as well as across the top surfaces. A nice giant oyster ball. These might also be termed small oyster reefs. 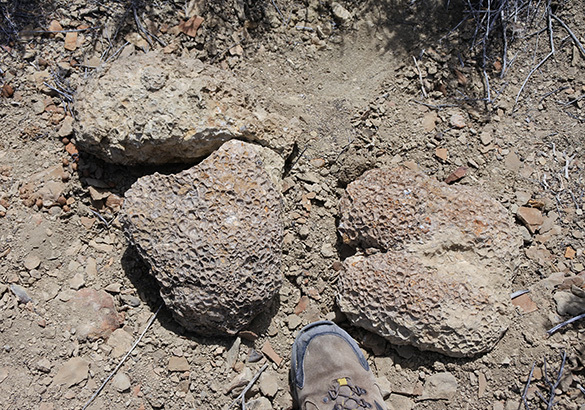 We also collected some encrusted hardground slabs the students had found at the DL site on an earlier visit. There are oysters on both sides of these slabs, meaning they were undercut on the seafloor or overturned. Either way, they show early cementation on the seafloor. 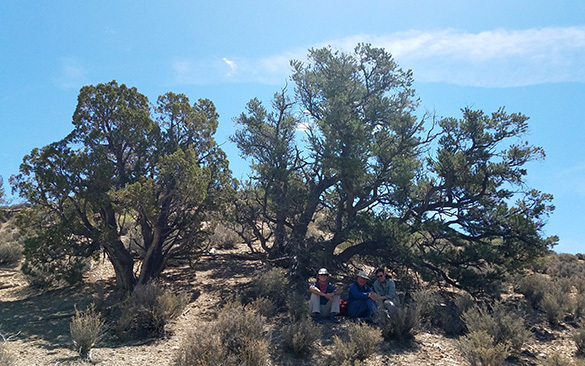 Nick took this image of the team finishing lunch under the welcome branches of a pinyon pine. 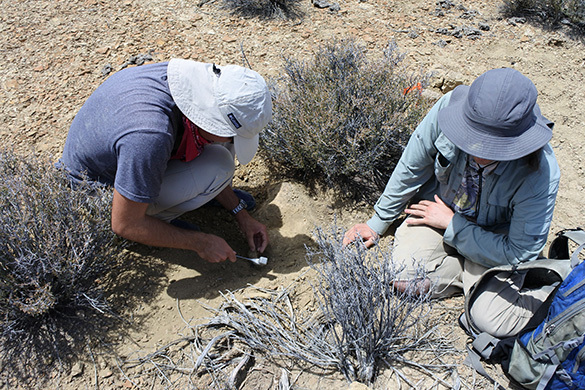 Nick did great work for us today by carrying out specimens and scouting new localities as we tediously accumulated data. 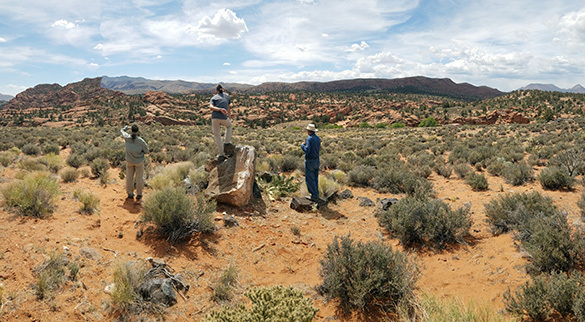 We ended the field day with a brief stop to admire the Navajo Sandstone south of the Gunlock Reservoir. What a gorgeous place for geologists!